As the year comes to an end, it’s time to reflect on talent wins, as well as areas for improvement, to set yourself up for success in 2018. 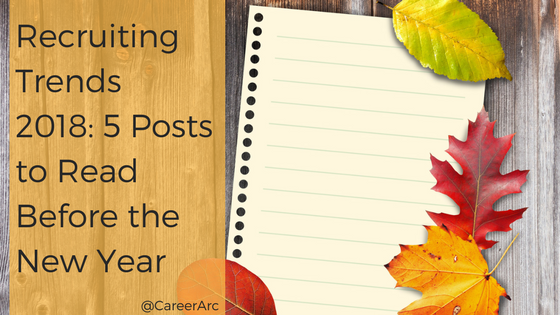 We’ve rounded up five posts that predict the top HR and recruiting trends set to impact your talent efforts so you can guide your team to new heights in talent acquisition, social media, and employer branding in the new year. According to Glassdoor, in 2016 the typical job opening took 28 days to fill. This article urges to seek opportunities in your hiring process to improve time-to-fill. One area it recommends to dedicate attention to is the candidate experience. With 60% of applicants reporting they’ve had a negative candidate experience, it would be wise to review how your online application and notification process is delivering the candidate experience you envisioned and at the speed you intended. Another recommended focus is planning for attrition. By being more prepared to handle change and turnover, you can anticipate talent needs and fill jobs in less time. Discover more ways recruiters can kickstart their planning for 2018. Some highly talked about trends in 2017 will have a bigger impact in 2018. For example, now more than ever, job seekers and employees alike are evaluating a company’s culture when deciding whether to apply to, or leave, an organization. This article predicts continued and increased investments in performance management so as to prevent employee burnout and flight risks. Actively maintaining a healthy company culture can also impact employer brand by ensuring the internal employee experience lives up to the external portrayal of that brand’s work culture. Get more recommendations for your 2018 HR guide. 91% of employers use social media to recruit talent today. In order to hire top talent, recruiting leaders need to take note of how professional networks are evolving, which social platforms are emerging, and what the up-and-coming Generation Z will demand from their job search experience. Learn four major social recruiting trends talent acquisition professionals and teams need to watch in 2018. A recent Glassdoor study found that 35% of hiring decision makers plan to invest in their diversity and inclusion efforts for 2018. The report asserts that hiring from a diverse candidate pool increases applicant quality. What sets the study apart is it’s offering of quantitative data linking the lack of investment in diversity hiring initiatives to impacts in candidate attraction. How will you recruit for a more diverse workforce? Read the reasons why diversity hiring will be a major focus next year, and learn the most up-to-date findings to help you garner support for a diversity strategy at your company. Many are predicting 2018 to be the year for even deeper tech innovation and adoption specifically in the recruiting space. When we surveyed over a thousand professionals on their innovation of choice, gamification and virtual reality applications topped the list. This article bets on the rise of A.I. 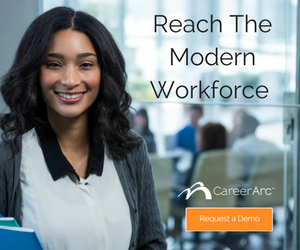 technology in HR to assist recruiting professionals in a multitude of tasks. Among them is identifying quality candidates among a large applicant pool, a capability which this piece optimistically perceives could eradicate the potential for unconscious bias in the vetting process. Discover the other big trends poised to continue into the new year and how they could reshape HR, learning and development, and hiring as we know it. Learn how to compete in the talent market of today and tomorrow. Download our Future of Recruiting Study now. Discover 5 posts that predict future HR and recruiting trends to guide you to talent acquisition, social media and employer branding success.